Queen Bee Gardens offers all natural gourmet honey candies for sale online, as well as candies or dark chocolates made with pure honey. 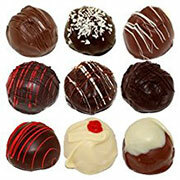 They do not wholesale their chocolates to any business anywhere. They are only available at Meeteetse Chocolatier in Meeteetse Wyoming due to the fact that they refuse to use additives and preservatives, so most of the chocolates that they create are only best within a few days. After 5 days the creaminess and texture begin to falter and they become stale. Now, if they ship off boxes of truffles to a retailer, by the time they get on their shelves they are already a day or two away from expiration.